Luxurious, Stylish & Comfortable. 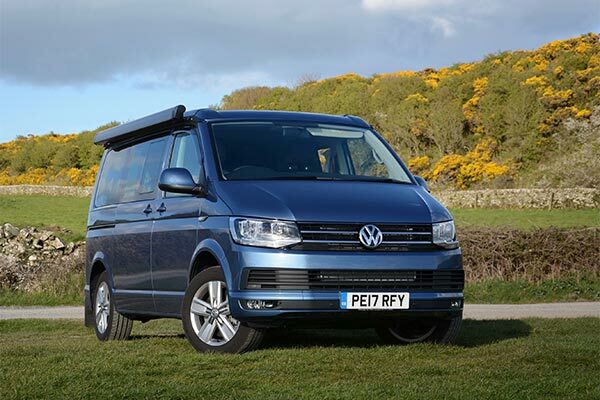 Tour Scotland in our VW California. 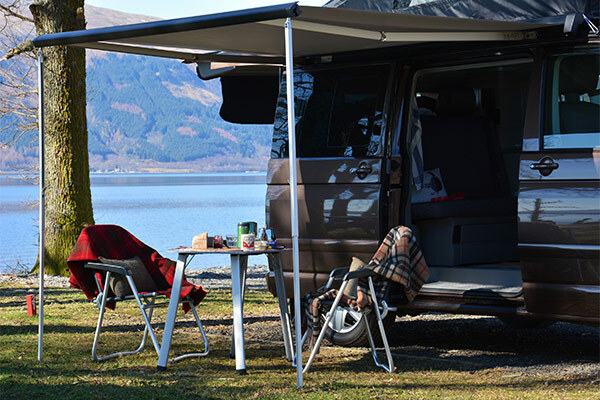 Bespoke Campervan Hire Edinburgh, Midlothian. The California seats and sleeps four people in comfort. Cruise Control, ABS, EBD, ESP, Airbags and more. Comes with stored table and two chairs. At the press of a button the roof rises and falls hydraulically in seconds. Raising the upper bed then sees you standing tall, able to cook with ease, or prepare for a good nights sleep. The two front seats swivel round, and you have a room, to talk, play games, read or watch a film on your lap top or iPad in total comfort. If cold, a quick visit to the control panel turns on the heater, keeping the cabin at a temperature of your choice. The California seats and sleeps four in style. 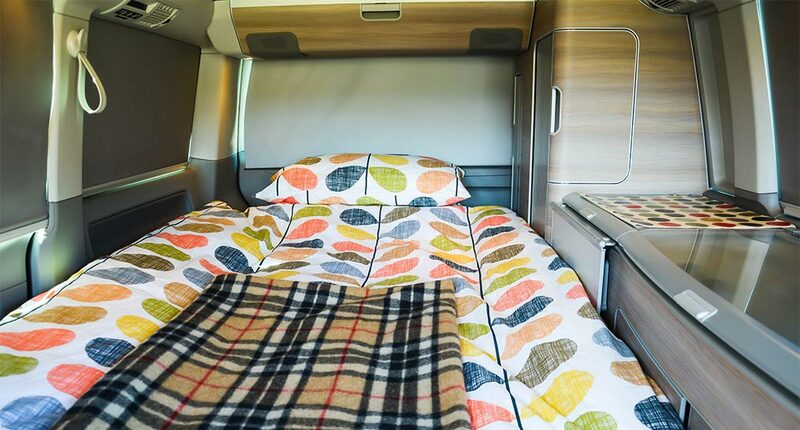 Simply pulling forward the bench seat, folding down the seat back and rolling out the mattress topper gives a bed comfortable for two. The upper bed can then be lowered into place, bedding unpacked, and a perfect nights sleep awaits. Blinds pull down or are attached for added privacy, and there is even a safety net that can be fitted to stop small children falling from the upper bed. The kitchen comes fully equipped. A two ring gas hob, sink, 42Litre fridge, cupboard and pull out table are integrated in a very precise way. Once mastered, using the space and cooking is a simple and unhurried pleasure. There is plenty of lighting, 12 and 240v sockets, water electrically pumped to the sink from the 30 litre tank and a waste water tank as well. 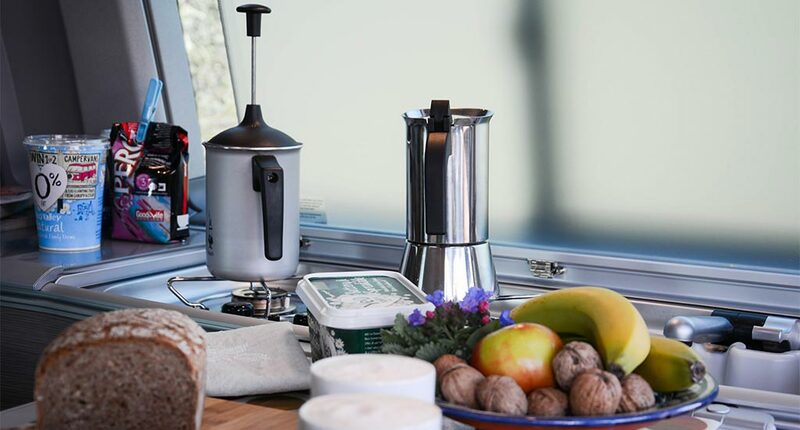 We will supply all the things you need in the kitchen, from the collapsable colander to the Cafetière. We supply the gas bottle and an additional portable camping stove and gas bottle, for those times you want to cook outside. You may even hire a Cobb Barbecue from us. Driving the California is a pure joy, easy to handle, manoeuvre and park. 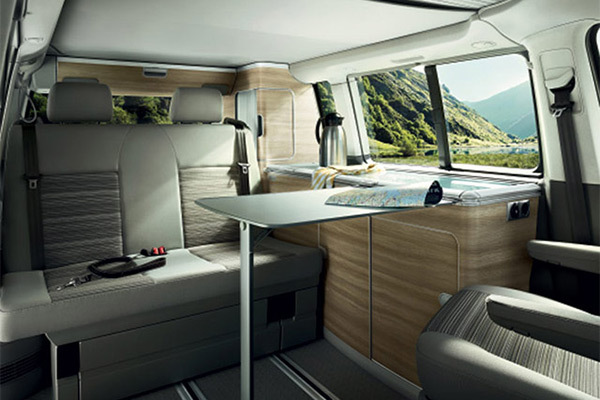 You are sat high up affording a stunning view as you journey, with the added safety of being able to read the road further ahead and more clearly at junctions than in a normal car. There is enough power to allow easy overtaking, effortless cruising, and the strength to climb any hill. With the DSG Automatic Gearbox and excellent Sat Nav, you are more free to concentrate on everything else. It is happy on the motorway, but is best experienced on the winding Scottish back roads, where you find yourself relaxing and rolling with every curve, bend and rise, wishing the journey would not end. It feels like the pinnacle of independence. Go anywhere, anytime, freely. Driving around town has more in common with an estate car, is stress free and takes little time to learn, and parking is made easy by the large mirrors and the guidance of the parking sensors.